Thoran or uppeari is common companions of rice in vegetarian as well as non-vegetarian kitchens of Kerala. 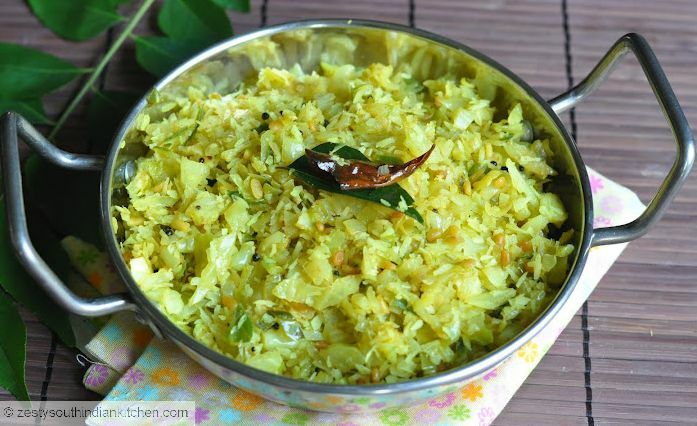 Thoran is a dish made with coconut, (as Keralites life without coconut is impossible) dry and prepare with in no time. Thoran can be made with all kinds of vegetables including exotic asparagus except water rich melon, squash etc. If you have thoran and curry in your meal then “oonu kushalayi”( means very good) and if have pappad along with it will be another plus point. 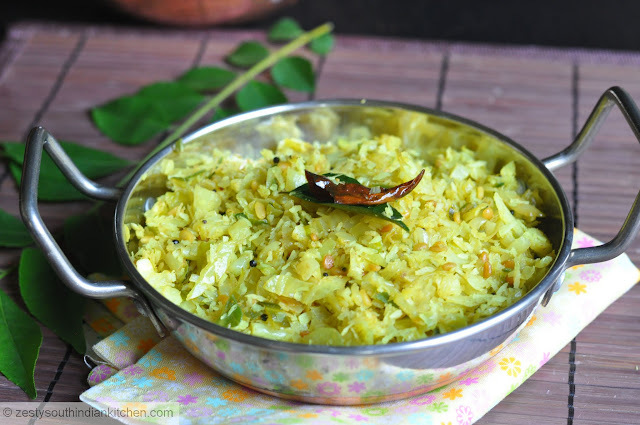 I love to make cabbage thoran by itself, or sometimes I mix it with carrot or beet root. Amma used to make more often during my child hood, usually cabbage thoran and sambar are favorites in the menu. Usually thoran can be made with or without garlic. Turmeric has important anti-inflammatory properties and it is excellent source of antioxidants according to this source. It is one of common ingredients in my diet, I make curries, even sweets ( needs yellow food coloring ) with them. I can’t think of a life without them. Because without turmeric living is impossible. Cabbage is also an excellent source of vitamin C. I made this way. Heat oil in a pan add mustard seeds, halved red chillies and urad dal as mustard seeds start popping add cleaned and chopped cabbage. Then add turmeric powder and salt and cover the lid. Let it cook for 4 minutes. If you are using fresh or frozen coconut ground them with cumin and red chili powder to form coarse paste with less water. Once cabbage is cooked add ground paste of coconut (as I used desiccated coconut, I didn’t grind them) with cumin and red chili powder and mix well. 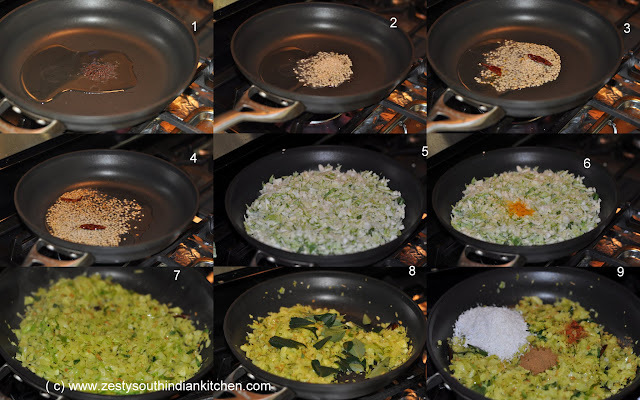 Add curry leaves and stir for another 2 minutes and switch off the flame. Enjoy with curry and rice. This is Swathi ( Ambujom Saraswathy) from Zesty South Indian Kitchen who loves to explore cuisines from all over the world. Whenever possible I try to to give an Indian touch to several of the world cuisine, and has weakness for freshly baked bread. All the recipes you see here are created by me and approved after taste-test by my family. Yummy cabbage thoran…Love this with rice and sambar..